Specifically about the maltodextrin in (some) Starbucks sugar free syrups, and whether that kicks you out of ketosis or spikes your insulin worse than sugar. Today I want to clear that up. Then there’s also the source they heard it from, and the facts (truths) – as well as the facts that are NOT shared in those sources. I’ll share an example on that so you can see what I mean, which should help you make more informed decisions (and do further research yourself) in the future. 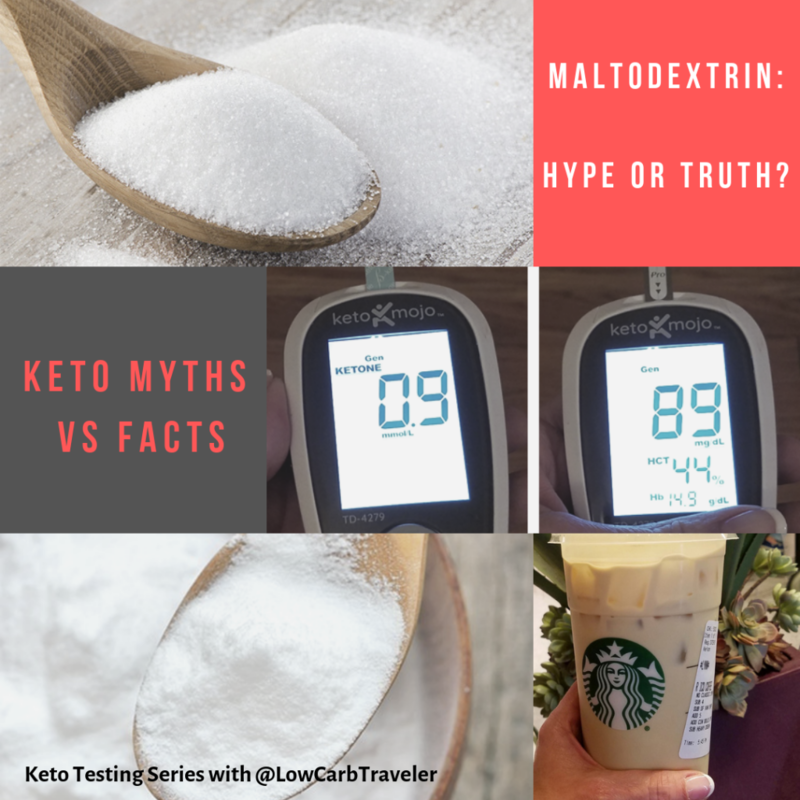 For this post I’m using maltodextrin and my Starbucks order as an example as just one of many common “keto scares.” But what you’ll learn here can help you understand (or better research) similar “hot topics” in the keto community. The big thing you’ll always hear about anything that contains maltodextrin (and thats A LOT of things!) is that it’s glycemic index is almost twice as high as sugar, and that it will spike your blood sugar through the roof. You’ll learn what maltodextrin IS and reasons you may want to avoid it, which of the Starbucks sugar-free syrups have maltodextrin and which do not, why people say maltodextrin is “not keto” and more. You’ll also get to see my blood sugar results – where I tested it on myself. Maltodextrin is basically just an additive. It’s used as a preservative, a thickener and a filler. It’s also used as a carrier, to add other ingredients to products. It’s in A LOT of products such as: vitamins, baby formula, beer, beef jerky, medicines, protein bars & shakes, dressings, electrolyte drink mixes, sodas, you name it – you’ll often find it in STEVIA even. You’ve been consuming and using maltodextrin ALL your life, so it’s nothing new since you went keto. It’s even in personal care products like lotion, shampoo, etc. There are plenty of reasons NOT to love Maltodextrin but you should make your decision based on ALL the facts. And that decision can be personal to you. What you’ll often hear in keto communities is maltodextrin is “worse than sugar” – meaning the glycemic index is higher than sugar. The last part is true. I’ll explain why. Because I love Dr. Berg and his work. I’m not saying Maltodextrin is great or even good or that there aren’t reasons you may choose to avoid foods that contain it. I’ll share all the details with you, then that’s a decision you can make for yourself. The fact that most people are leaving out of their argument that maltodextrin IS THE DEVIL is that there is such a SMALL amount of it in any one serving or any one food or drink you may consume – so you are NOT consuming equal amounts of sugar and maltodextrin, EVER. That is the (huge) point nobody ever explains. You simply cannot compare maltodextrin and sugar in that way, as if they are equal, because it would be a highly RARE case that you are consuming more than a TINY amount of maltodextrin – a trace amount, really. Consider drinking a Starbucks iced coffee with regular vanilla syrup vs sugar-free vanilla syrup. The grams of sugar in a regular sweetened iced coffee vs the grams of maltodextrin in a sugar-free iced coffee are not even comparable. 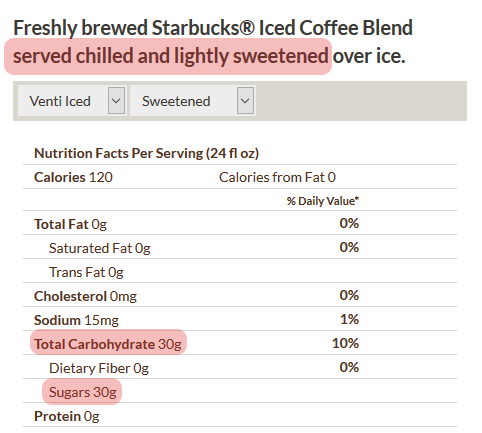 Starbucks Iced Coffee is served “lightly sweetened” by default, but is not AT ALL sweet so you would never know it. The classic syrup (sugar water) they add by default has 30 grams of sugar in a 24oz Venti Iced Coffee. If you add 4 pumps of regular vanilla syrup (not sugar free) to your iced coffee, that’s 20 grams of sugar per tbsp – assuming a pump is a tbsp. 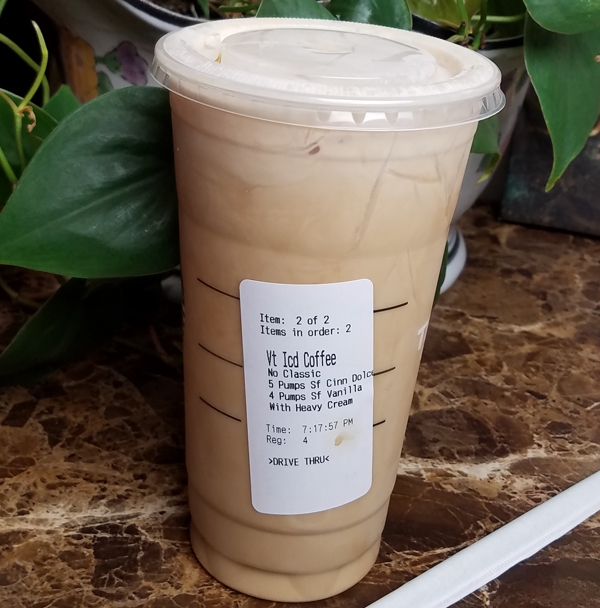 When you include the Classic Syrup (30 grams of sugar) you have a total of 110 grams of sugar in a Venti iced coffee with 4 pumps of vanilla syrup. We’ll use this comparison because the Starbucks sugar-free vanilla syrup has maltodextrin in it. 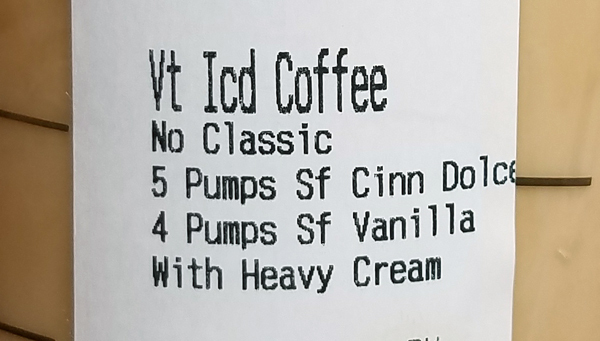 Compare that to what I would order: a Venti iced coffee with “no classic syrup” (without the sugar water) and 4 pumps of sugar-free vanilla syrup. Even if you counted 1 carb per pump (some people do, some don’t), that comes to 4 carbs vs 110 carbs. Again: 20 grams of sugar per pump of regular vanilla syrup, or 20 carbs vs 1 carb per pump of sugar-free vanilla syrup. Obviously you are NOT consuming equal amounts of sugar and maltodextrin. That’s the point no one mentions when they say maltodextrin has a higher glycemic index than sugar. I can’t personally think of a situation on a keto diet where you would consume more than a tiny amount of maltodextrin – and certainly never comparable to the amount of sugar in a high carb version of the same food or drink. Further down you’ll see that Starbucks lists their sugar free syrups as ZERO carbs per 2 TBSP serving on the nutrition facts label. So I’m not sure who started the rumor that they were 1 carb per pump. Or maybe it’s a round up / round down issue. I have no idea. But I doubt the total carb count of the sugar free syrup (whatever it is) is from the maltodextrin alone, which again – is a trace amount. 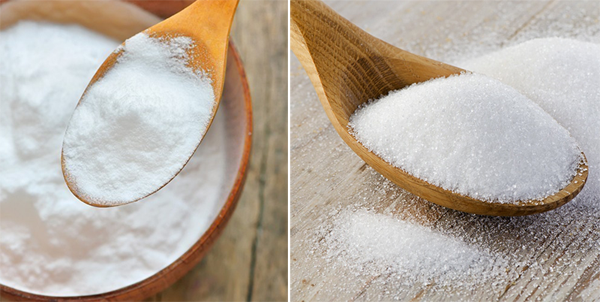 Does maltodextrin cause a “MASSIVE SURGE” in your blood sugar? The photo above was an iced coffee I had from Starbucks this week. I had two actually because I was in the city several days this week. I only have them now and then, it’s not a daily thing just a treat, because I don’t have a Starbucks where I live. First, you should know: my coffee order is SWEET and it’s HUGE. I sip on it most of the day and rarely ever finish one in a day. I’ll stick it in the refrigerator and finish it the next day most of the time, even. That amount of heavy cream usually makes me feel full too, so I eat less on the days I have it. It almost serves as a meal replacement! It has about the same amount of calories as a BPC or fatty coffee, depending on the amount of cream you ask for. I usually say that with my fingers showing I mean 1/3 cup – not one third of THE cup. If I don’t specify the 1/3 cup of heavy cream, I log it as at least half a cup. They can get pretty heavy handed with the cream for my taste. I did that because I wanted to be able to drink the entire thing in under an hour, like I would guess most people do – instead of sipping on it throughout the day. I’ve been drinking that same Starbucks order over the last year with NO problem, and with my ketone levels holding steady, but for this test I wanted to consume it all at once. I got one and stuck it in the fridge so I could do this testing at home the next day. Let me just say… THIS tasted super sweet, more like a milkshake. I would not normally get this much sweetener in a smaller iced coffee like this, but I wanted to really put this “maltodextrin” issue in the sugar free vanilla to the test. 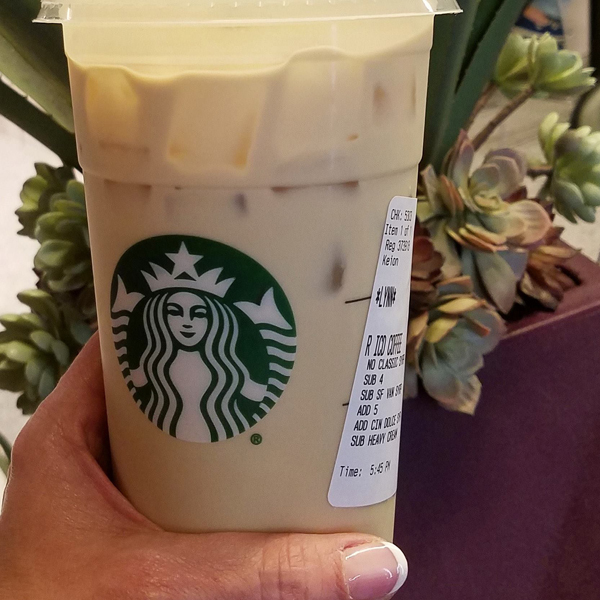 If that iced coffee had NOT been ordered sugar free and with no classic syrup, it would have been 210 grams of sugar – plus 3.2 carbs for the heavy cream – for a total of 213.2 carbs. I didn’t order this coffee, a friend brought it to me so I could do this test, so I definitely logged this one with half a cup of HWC (3.2 carbs) vs my usual 1/3 cup request (2.1 carbs). Again, I’ll show you how I log it below, but even if you DID count 1 carb per pump of sugar free vanilla (the one with maltodextrin), that would come to 4 + 3.2 for a total of 7.2 carbs. I don’t log the syrups because they have zero nutritional value (no carbs, no calories), so I only log the HWC in my daily macro tracking. On the high end, for the people DO that log EVERY pump as one carb, my order would be 12.2 carbs. Still nowhere near the 213.2 carbs for a NON sugar free version, or the 210 grams of sugar. Does Maltodextrin REALLY Spike Your Blood Sugar? 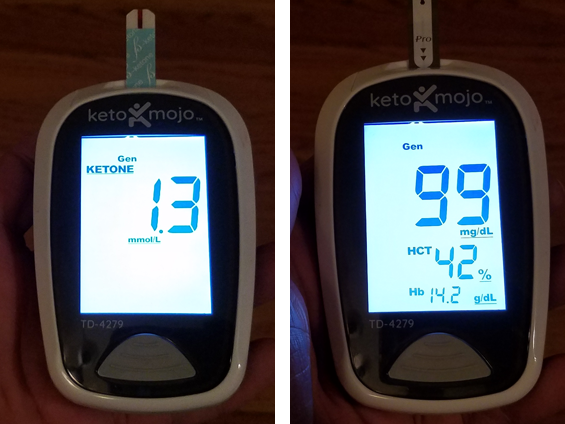 The image above is my starting numbers for this test: my glucose and ketone levels before I drank the keto Starbucks iced coffee. My glucose seemed a little high to start at 99. My baseline is around 85. My ketone levels were my normal level (1.3) for that time of day. 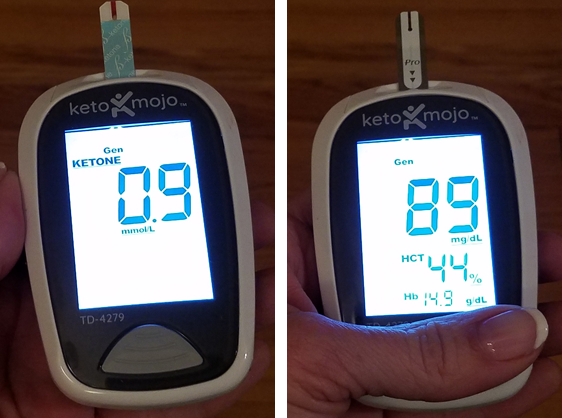 I use the Keto Mojo Blood Glucose & Ketone Testing Kit and that link will get you 15% off. If you want to learn more about it, here’s where I did a VERY enlightening video interview with the founder of Keto Mojo. For the purpose of this “keto test” I drank the ENTIRE 24 ounce Starbucks iced coffee within 30 minutes. This one was sweeter than my usual order (a smaller cup with the same amount of cream & sugar free syrups) – so it basically tasted like a MILKSHAKE. I wanted to really put that “maltodextrin creates a MASSIVE SURGE in your blood sugar when you consume it” comment to the test. As you can see, my blood sugar actually came DOWN. My ketone levels dropped slightly too, but that’s not unusual as they fluctuate throughout the day and before/after you eat. 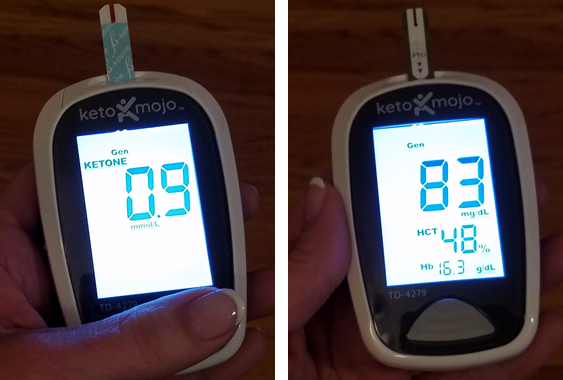 I was still IN KETOSIS at 0.9 and my blood sugar did NOT spike. The opposite actually. 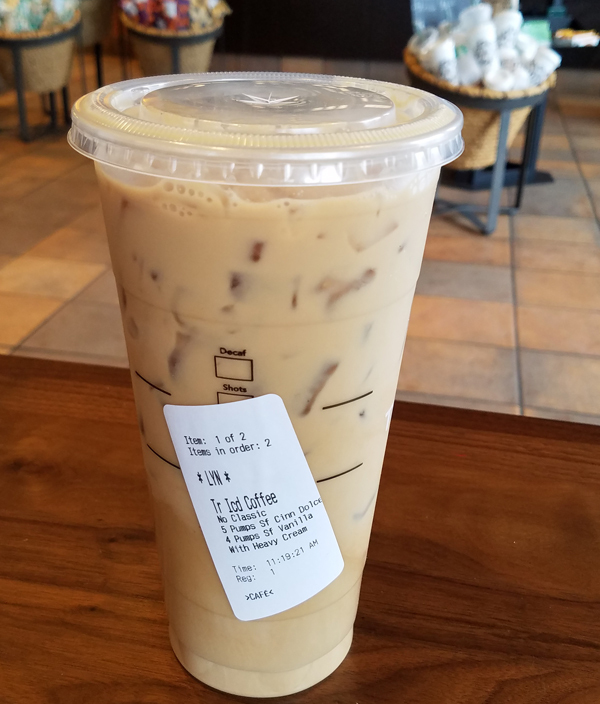 The Starbucks Iced Coffee is keto friendly. No question. 4 full pumps of sugar free vanilla syrup with maltodextrin did NOTHING to my blood sugar levels. Zilch – no impact. Starbucks used to offer more sugar free syrup flavors, but right now it seems that at most locations you can only get sugar free vanilla or sugar free cinnamon dolce. The sugar free vanilla DOES contain maltodextrin, and the sugar free cinnamon dolce does NOT. If you click each link, you can view the labels and nutrition facts. ALL of them say ZERO carbs per 2 TBSP serving. I think they’ve discontinued the sugar-free hazelnut and caramel syrups, as well as the sugar free peppermint syrup which used to be available during the holidays. NOTE: their “whipped cream” HAS SUGAR IN IT so you definitely want to avoid that and use heavy cream or half & half in your Starbucks orders instead. Some people say the syrups are 1 carb per pump. They don’t affect me and the labels say ZERO on the bottles you buy to use at home, so I don’t log them – but that’s a personal choice (too). I log the amount of HWC (heavy whipping cream) I ask for which is usually 1/3 cup – or if I don’t specify or it looks lighter than usual, I log it as 1/2 cup (half a cup) to be safe. 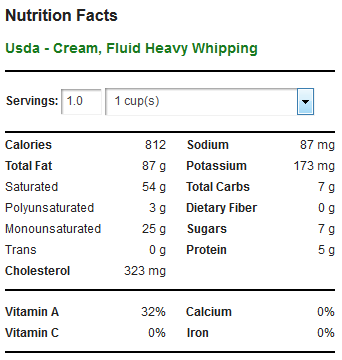 Heavy Whipping Cream is 0.4 per tbsp, regardless of what your label says. When it comes to labeling, they are able to round up or round down. Anything less than half a carb can be labeled as zero, which is why most heavy whipping cream labels say zero carbs. That can really add up on you in recipes though! You simply want to find an entry in MyFitnessPal, or the tracker you use, that counts heavy whipping cream (HWC) as 1 carb for 2 TBSP. It’s also 50 calories per TBSP if you’re counting calories. It’s worth noting that everyone may respond differently to various types of sugar free sweeteners or foods/products. It’s also worth noting that most people DO NOT properly do clean testing like I do, so their results may be skewed or diluted. I do a full six day clean test on any new food or ingredient. That means I eat super simple known/tested foods (eggs, pecans, beef, etc) and often mono meals (single ingredient meals) for 72 hours prior to a glucose/ketone test. I do this to get my body to baseline numbers, or optimal ketone/glucose levels, and so that there are NO other factors affecting my test. I then test a single new food or ingredient (or Starbucks order), and follow that with another 72 hours of clean eating. I do that because it can take up to 72 hours to fully metabolize anything you consume – and longer if you drink alcohol. I mentioned all of this in my recent sugar free chocolate chips keto test post & video. I said then and I’ll say again: I don’t trust anyone else’s results. That’s for two reasons. First because we are all different. And second because I don’t know ANYONE that does a full 6-day CLEAN test, and doesn’t take a single bite of anything else questionable. This is a matter of comparing avocados to avocados – instead of avocados to apples. Back to maltodextrin which is apparently “THE KETO DEVIL” according to keto communities and self-proclaimed keto gurus… I found it very interesting that the whole craze is based solely on a glycemic index comparison ONLY. It’s simply not a fair comparison, as I demonstrated. 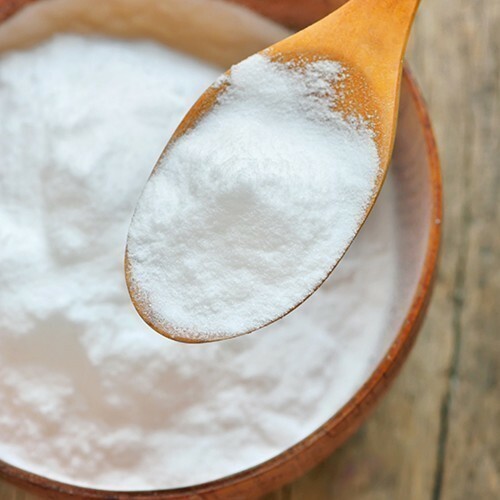 A trace amount, and that’s what it is: a TRACE amount, of maltodextrin is not at all the same as a serving of sugar – in any food or in any situation. Unless you’re testing a full TBSP of each side by side, which is just silly. As for me, I’m going to continue enjoying my keto-friendly Starbucks iced coffees. It’s really such a minor thing to cause such a HUGE stir across keto communities, in my opinion anyway. I’m sure I’ve been consuming maltodextrin pretty much all my life, way before I went keto, and in more foods and products than I even care to know about. I just can’t be bothered to scrutinize every little ingredient ALL the time, or to cut out something so ENJOYABLE as my sugar free iced coffee – which is a treat, by the way, not a daily thing but an occasional indulgence. I also don’t gulp down the entire thing but rather sip on it and usually drink maybe half, then stick it in the refrigerator and finish the rest of it the next day. You can’t possibly believe the AIR is clean on this polluted planet we live on. But that’s just me. I want to live freely and enjoy my life, and enjoy the widest range of flavors and foods and experiences, while staying in nutritional ketosis. Simple! Like I said, it’s a personal preference. My coffee date friend prefers NOT to consume maltodextrin. He also doesn’t eat beef or pork. All personal choices, and all fine by me. He orders the iced coffee with heavy cream and sugar free cinnamon dolce syrup, then adds a packet of stevia from his pocket. Just between you and I, his stevia packets list dextrose as the first ingredient – which is pretty much the same thing as maltodextrin (proof). Shhhh!! Dextrose and maltodextrin are very similar. Something to Google if you’re interested. Also, anytime it says “natural flavors” maltodextrin may be used as the carrier for those. I always find it sketchy when “natural flavors” is listed as an ingredient – with no explanation of what those are exactly. But again, if it tastes good and tests good – I’ll probably eat it. Thoughts or Questions on Keto Starbucks or Maltodextrin? This is the reason you need to do your own testing though, in all seriousness. Don’t just blindly believe everything you read or watch online, or heard somewhere. It’s all about knowing how YOUR body responds to certain foods or ingredients, your bio-individuality, and not giving in to hype and sensationalism and silly arguments or scare tactics – but testing for the TRUTH.